There is great symbolic importance to the lone U.S. House race where votes are being recounted. If Martha McSally (R) holds her narrow lead against Rep. Ron Barber (D, AZ-2), Republicans will have netted 13 House seats, giving them 247 in the 114th Congress and narrowly topping the 246 seats the Republicans held after the 1946 election, giving the GOP its biggest House caucus since 1928. If Barber somehow survives, the Republicans will only tie that mark with a net gain of 12. The GOP gain proved to be a bit smaller than seemed likely on Nov. 4: ABC News, for instance, projected a 14-to-18 seat Republican net on Election Night. But Democrats won nearly all the races that were called in the days following the election. Still, the Republicans did slightly better than most prognosticators expected (we pegged them for a gain of nine before the election). The outcome in AZ-2 doesn’t really change the overall outlook for the House going into 2016: Republicans have built themselves such a big advantage that it will be difficult, though not necessarily impossible, for Democrats to win back control of the chamber this cycle. Assuming McSally wins, the GOP will hold a 247-188 edge in the House, meaning that Democrats would have to flip 30 seats to win back the lower chamber. There is historical precedent for such a gain in a presidential election year: In 1980, for instance, Ronald Reagan and the Republicans netted 34 House seats, although it’s worth noting that even such a big gain only brought the Republicans up to 192 seats in the House, similar to the Democrats’ current low ebb (the Democrats dominated the House from 1931 to 1995, controlling it for 60 of 64 years). In 1948, Harry Truman and the Democrats decimated that previous GOP high water mark, gaining 75 seats to re-take the House after the Republicans captured it two years before. And in 1928, Republicans added 30 House seats to their House majority while winning a third party term in the White House. That’s perhaps the best historical precedent for Democrats, given that they too will be seeking to win the White House for the third straight time. Of course, it seems odd to suggest that Democrats can find inspiration from the election that gave the nation Herbert Hoover’s presidency. And dusty history means little compared to a seat-by-seat analysis that, at first blush, shows a secure Republican House majority. Republicans now control 26 seats won by President Obama in 2012. So even if Democrats somehow swept all of these seats in 2016, they would still be four seats short of a majority. Here’s an easy prediction: The Democrats will not sweep these 26 seats. Some of the Obama Republican districts have entrenched, long-term incumbents like Reps. Ileana Ros-Lehtinen (R, FL-27), Frank LoBiondo (R, NJ-2), and Peter King (R, NY-2) whose seats probably will not be very competitive until they retire. Also, these 26 seats do not all lean Democratic, despite being won by Obama in 2012: Mitt Romney matched or exceeded his 47% share of the vote in more than half of these districts (16 of 26). The Republicans are overextended, but not overwhelmingly so. Even if Hillary Clinton or another Democrat won the White House in 2016, there might be limits to the coattails she or he could produce because of the lack of truly winnable swing districts currently held by Republicans. Five Democrats hold districts won by Mitt Romney in 2012, and there are a number of other seats won by Obama in 2012 that Democrats only narrowly held this year. So Republicans will have at least a few targets of their own. 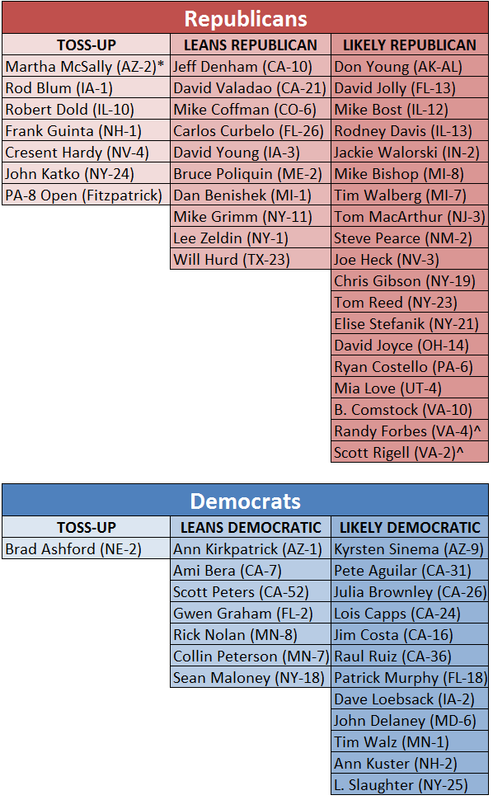 With that, Table 1 shows our initial 2016 U.S. House ratings of competitive seats. Analysis of these seats by category follows. *AZ-2 remains uncalled, but we’re assuming that Martha McSally (R) will defeat Rep. Ron Barber (D) following a recount. ^If VA-4 remains the same, it would be Safe Republican, but court-ordered redistricting could make it much more competitive for Rep. Randy Forbes (R). So we’re holding it at Likely Republican for now. Redistricting could also alter Rep. Scott Rigell’s (R, VA-2) district. If you don’t see your district listed here, that’s because it’s one of the 379 districts that starts as safe for one party or the other. That’s 87% of the 435 House seats. Just eight races start as Toss-ups, and one of them, AZ-2, is still stuck in the 2014 cycle as McSally (R) leads Rep. Barber (D) by 161 votes heading into the recount. This has been one of the closest districts in the country the past three cycles, so it only makes sense to view it as a Toss-up once a winner — probably McSally — officially emerges. Seven of the eight Toss-ups are held by Republicans, which makes sense given their big majority and their 2014 gains in Democratic-leaning turf. Probably the most vulnerable Republican is Rep.-elect Cresent Hardy (R, NV-4), who was an accidental winner against outgoing Rep. Steven Horsford (D) thanks to horrible Democratic turnout in Nevada. Reps.-elect Rod Blum (R, IA-1), Robert Dold (R, IL-10), and John Katko (R, NY-24) will sit in the three most Democratic districts held by any Republican — Obama got at least 56% in all three in 2012 — and Rep.-elect Frank Guinta (R, NH-1) will occupy a swingy seat that he lost in 2012 before reclaiming it in 2014. It’s not impossible that he will square off against outgoing Rep. Carol Shea-Porter (D) for the fourth straight time, which would be similar to the four straight battles between ex-Reps. Baron Hill (D) and Mike Sodrel (R) in a southern Indiana district from 2002-2008. Finally, Rep. Mike Fitzpatrick (R, PA-8) is apparently honoring a self-imposed term limit, so his competitive but slightly Republican-leaning seat will be open and should be hotly contested. Without weighing in on the wisdom of term limits, Fitzpatrick will deserve a tip of the cap if he follows through on his promise. Only one Democrat starts as a Toss-up: Rep.-elect Brad Ashford (D, NE-2), who defeated the very unpopular outgoing Rep. Lee Terry (R). The district leans Republican, although President Obama won its electoral vote in 2008 (but not in 2012). A better GOP candidate would put Ashford in serious peril. Rep.-elect Gwen Graham (D, FL-2) is a very shaky Leans Democratic. Like Ashford, she won a Republican-leaning district against a flawed incumbent, outgoing Rep. Steve Southerland (R), and Republicans will have a great incentive to defeat her. If they don’t they will probably have to contend with her as a statewide candidate down the road (it’s not impossible to imagine her running this cycle for the U.S. Senate seat currently held by Republican Marco Rubio, but that seems like too quick of a statewide leap). However, Graham’s pedigree — her father, Bob Graham (D), is a former governor and senator — and strong performance as a candidate prompts us to install her as a small favorite to start. The same is effectively true of the six other Democrats in the Leans Democratic column, all of whom are incumbents in competitive districts who held off strong challenges in 2014. So long as 1.) They want to run again and 2.) 2016 is a better environment than 2014, they all should start as modest favorites. The Leans Republican column is generally made up of two kinds of members. The first group features incumbents with little service time who hold districts that Obama won in 2012, Reps. Jeff Denham (R, CA-10), David Valadao (R, CA-21), Mike Coffman (R, CO-6), and Michael Grimm (R, NY-11). All four won comfortable victories in 2014 but could be in for tough battles if 2016 is a more Democratic year. The case of Grimm, who won by double digits despite a looming trial on federal fraud charges, is especially interesting because he may or may not be on the ballot in November 2016. The other group in the Leans Republican group features five newly-elected members from swing districts, all of whom will be targeted by Democrats. We’ll give the newcomers a small edge to start but all could easily fall into the Toss-up category depending on how the cycle develops and who decides to challenge them. Not fitting into either category is Rep. Dan Benishek (R, MI-1), who initially won in 2010 and then survived competitive races in 2012 and 2014. Obama only won 45% in 2012 in this Upper Peninsula-centered district, which makes it the most Republican district of any mentioned in the Toss-up or Leans Republican categories. A strong, well-funded Democratic challenger could beat Benishek if circumstances allow. If Democrats really want to put the House in play, they will need to win many of these Likely Republican seats. Perhaps some of these members will retire or make major mistakes, or perhaps the environment becomes bad enough for the Republicans that they will become surprisingly imperiled. The most noteworthy name on this list is Rep. Don Young (R, AK-AL), the long-serving gaffe machine who before the election seemed to blame some high school students for the suicide of a classmate. Outgoing Sen. Mark Begich (D) might decide that challenging Young, who barely cleared 50% in November against no-name opponents, presents a more promising road back to Washington than running against Sen. Lisa Murkowski (R-AK). Begich’s father, Nick, held this seat before he disappeared in a presumed plane crash in 1972. Nick Begich defeated Young, posthumously, that year, but Young won a subsequent special election and has held the seat ever since. Also notable on this list is Rep. Randy Forbes (R, VA-4), whose district might become much more Democratic thanks to an October court order to redraw the neighboring, majority-black district of Rep. Bobby Scott (D, VA-3). A redraw of Scott’s district, which gave Obama 79% in 2012, could also hypothetically make Rep. Scott Rigell’s (R, VA-2) already swingy district more Democratic. It remains unclear what will happen, though. The Virginia Republican congressional delegation appealed to the Supreme Court, so the ruling might not stand, and it’s also possible that Gov. Terry McAuliffe (D) and the Republican-controlled state legislature might agree to a new map that makes only minimal changes, which would not affect Forbes or Rigell much. Stay tuned. Notably missing from this list of Democratic targets are Appalachian seats that the party has lost over the past few cycles in places like Eastern Kentucky, Southeast Ohio, West Virginia, and Western Pennsylvania. We just think these districts have become too Republican at the federal level in the Age of Obama. Some Democrats are hopeful that these areas will become less hostile with Hillary Clinton at the top of the ticket. We doubt it, but that is possible. One of the big challenges for Democrats in retaking the House is that they have been locked out of much of Appalachia and the South, regions that used to send many moderate-to-conservative Democrats to the House. As it stands now, we see the Democrats’ path to their next House majority going through the suburbs as opposed to rural America, and that is reflected in the ratings, particularly in the list of mostly long-shot targets in the Likely Republican column. The Likely Democratic column features 12 seats, and nearly half (five) are California seats that were close in 2014. Presidential-level turnout makes Democrats solid favorites in all five, though. Also noted here are Reps. John Delaney (D, MD-6) and Louise Slaughter (D, NY-25), who had surprisingly close calls on Election Night in Democratic districts. Again, presidential turnout will likely help both in 2016, although Slaughter, who will be 87 by the time of the next election, could retire, clearing the way for a younger Democrat to solidify this Rochester-based district that Republicans have no business winning: Obama got 59% here in 2012 but Slaughter shockingly won by less than half a percentage point last month. Plenty of this will change as members retire, run for other offices, and turn heads with their overperformance — or underperformance — in office. A few members — but probably just a few, if history is a guide — will lose primaries. Surprisingly impressive challengers will emerge, and seemingly impressive challengers will fizzle. Mid-cycle redistricting, in Virginia or in other places depending on the whims of the party in power or by order of the courts, could change the playing field. The national environment two years from now will play an outsized role in the results, and while the electorate will likely be at least slightly friendlier to Democrats than 2014’s was, it’s not impossible that 2016 will be for Democrats what 2008 was for Republicans, a presidential-cycle wipeout that followed a midterm wipeout. On the other hand, a combination of factors — lots of Republican retirements in swing districts, GOP mistakes, primary chaos, excellent recruiting, a huge Clinton presidential triumph, etc. — could all break in the Democrats’ favor, a miracle scenario that could deliver them the House. There’s just no way of knowing at this point what will happen nationally. Our early expectation is that the Democrats will net at least a few House seats in the 2016 election. The Republicans are overextended, and some of the districts they won in 2014’s low-turnout, wave environment probably will come home to the Democrats in a higher turnout presidential election. Of the 25 districts that seem most competitive right now — the Toss-ups and the Leaners — 17 are currently held by Republicans. So the Democrats should be able to play more offense than defense this cycle after having to suffer through the opposite last cycle. However, 211 seats start as Safe Republican, which is just seven seats shy of a GOP majority. Even if Democrats held all their current seats and won all the Toss-ups and Leans Republican districts, they would only have 205 seats, 13 short of a majority. The Democrats will need to expand the playing field in a major way to credibly challenge the GOP in the House. Bottom line: The Republicans begin the cycle with a very good chance to retain their U.S. House majority.